with Fr. 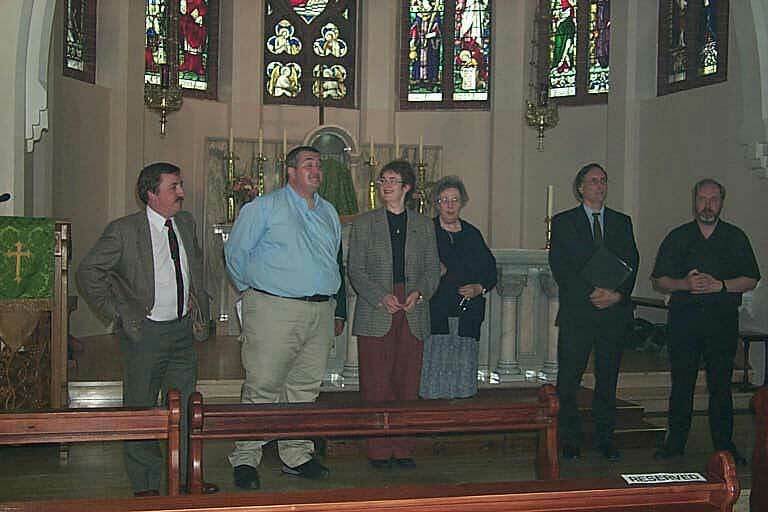 John Cahill - Parish Priest (right). 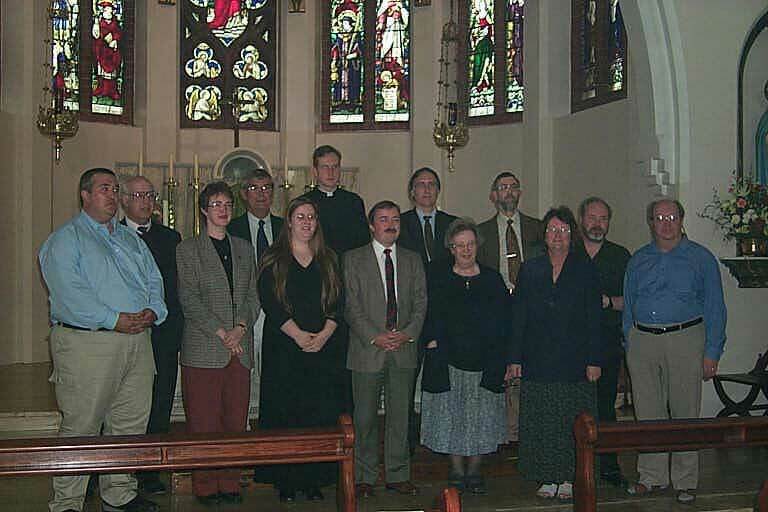 We are an ad-hoc choir with the emphasis on restoring Sacred Music to church services in its liturgical context as opposed to the concert hall or recording studio. Members, who are all volunteers, are at present based in the North of England and in Scotland. 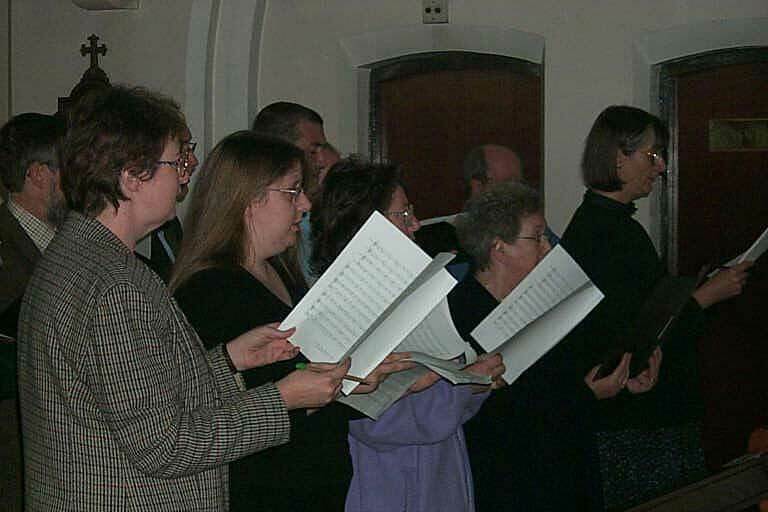 We normally sing four to five times a year at specially arranged services,and, annually, a Christmas Carol service based on nine lessons and carols.. We would like to increase this to sing for other services and in more locations throughout the UK. We are therefore looking for more people to join us. 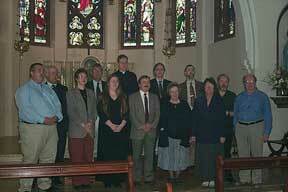 The choir is Catholic in ethos, though many of the singers are from other churches, mainly Anglican. 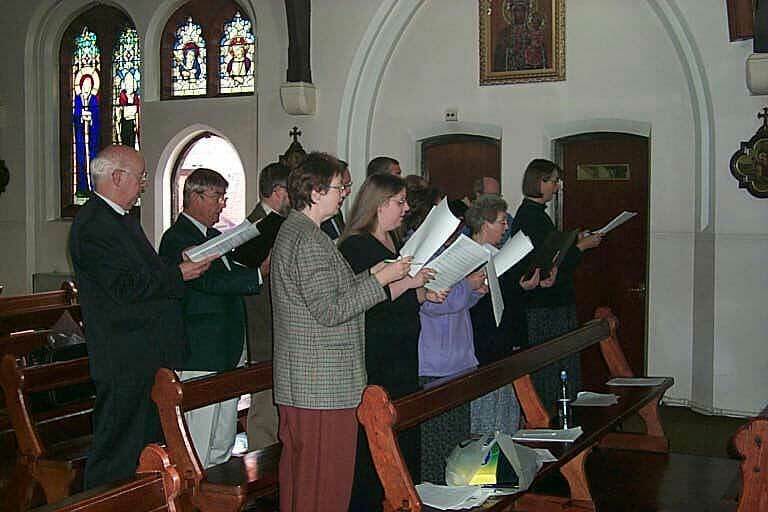 Anyone who wishes to sing traditional church music in its original liturgical setting would be made very welcome. Attendance varies from event to event, depending on the voices needed and the location of the churches where we sing. There is no commitment to sing for every service, though the more people can manage the better! 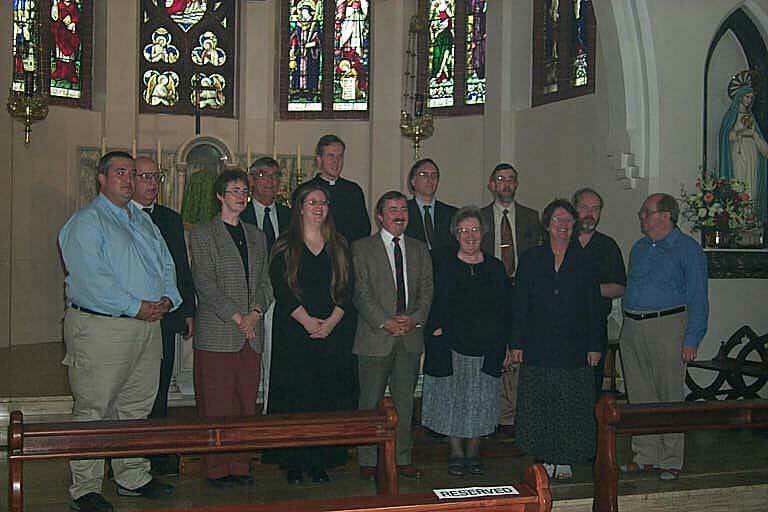 Our repertoire consists mainly of Gregorian Chant and Polyphony, and we occasionally join forces with other groups to great effect. Music we have sung so far include masses by Palestrina, Victoria, including both Requiems for 4 & 6 voices, Byrd (3, 4 & 5), Mozart, Haydn and several others & as well as several motets by these composers and many more! If, having read all this, you are interested in joining us from time to time, then please, contact me, Mike Forbester on mike4b1-at-gmail.com. If you want to know what we're singing and when, please view our Calendar page. A little more background information. 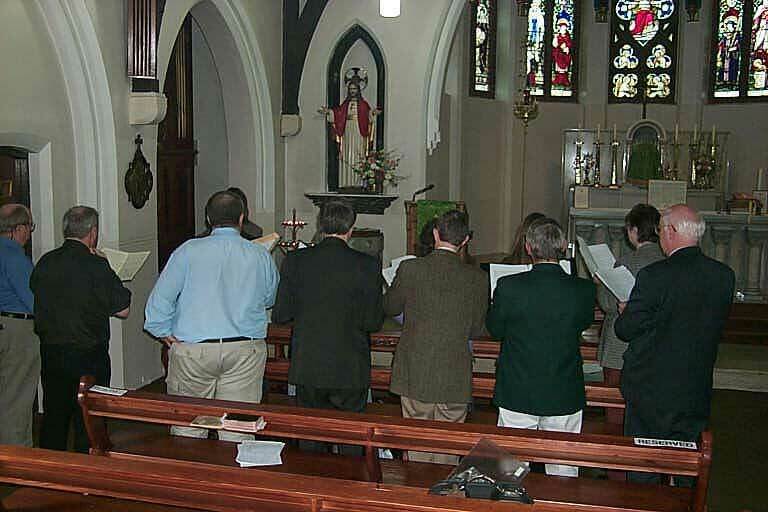 Briefly we started out back in 1996 to sing at a one-off Traditional Rite Catholic Mass and are still going strong! At the moment our members are mainly based in Yorkshire, several from York itself, though with a significant number from West & East Yorkshire. We still get a few singers from North-East England, North-West England and Edinburgh occasionally. Religious affiliation is not necessary. We welcome anybody, whether they belong to any denomination or none at all. 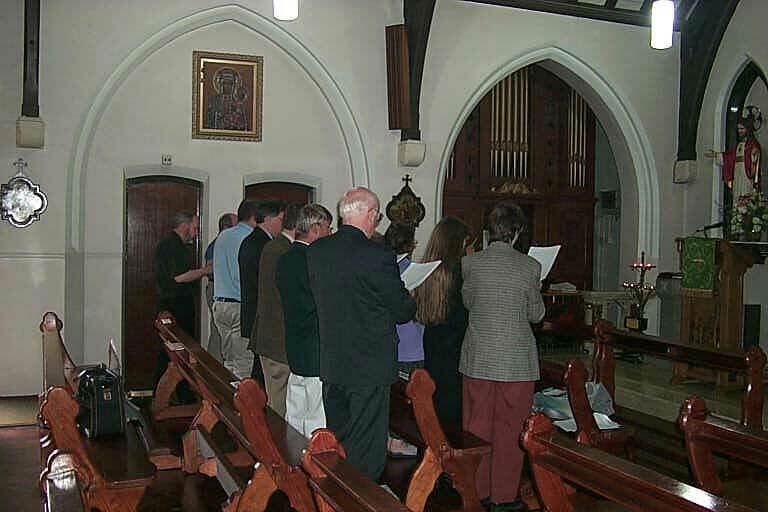 Over the years, we've had Catholics, Anglicans, Greek Orthodox, Methodists and a Buddhist, as well as people who simply love the music we sing and appreciate its liturgical setting. Although we don't audition, we do ask that singers look at the music to be sung (for any service) whenever possible, in advance of rehearsals, to avoid unnecessary note-bashing. Our singers vary from those who could (& some have) sung professionally, to those who are not the greatest singers in the world & would readily admit it - but nevertheless are prepared to learn whatever music is to be sung. We often prepare recordings of music whenever we can to help with learning the music in our own time, (helped considerably now by several recordings being available on sites like YouTube). This set-up seems to work pretty well as we all realise that we're not giving a concert performance, but singing the music as far as possible in its original liturgical context. Rehearsals only happen when we have a service to prepare for, an arrangement that we all like as it doesn't tie us into travelling [often] large distances on a regular basis - particularly as some of us also sing with other choirs. We aim to start proper rehearsals about a week to two weeks before a service on Saturdays usually in York, as this seems to be the location that most people can manage. Members sing with us knowing that they will be using their own computer ink and paper to print the music (wherever possible) and petrol to get to rehearsal venues and services, although people without their own transport will always be able to travel with other singers. However, the enjoyment we all get from singing beautiful music in some amazing churches far outweighs that; plus, we are a very friendly group!